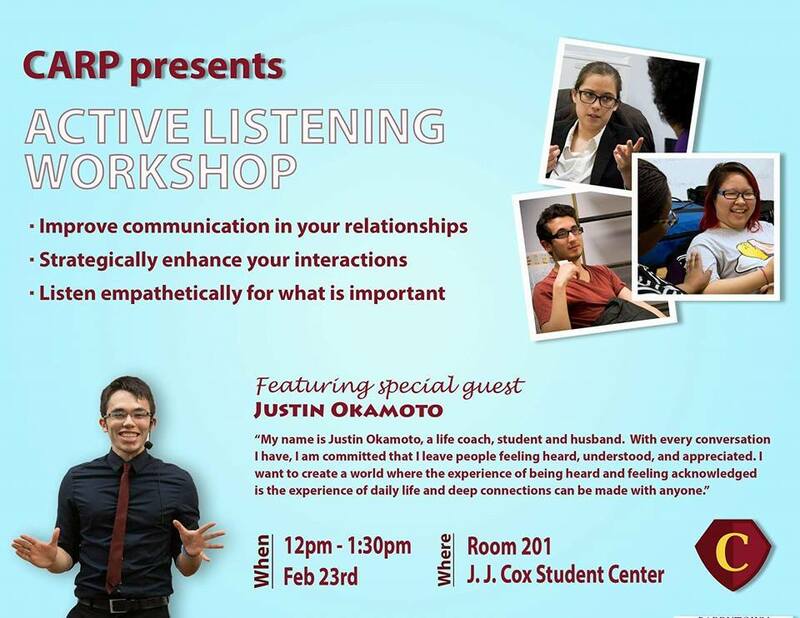 The CARP chapter at the University of Bridgeport invited CARP staff member, Justin Okamoto, to lead an “Active Listening” seminar on February 23, 2016. About 18 people gathered at the student center to learn and practice how to really listen, a skill that is highly underrated as a factor for true, authentic success in relationships. Share the Art of Listening with Your Community! The ‘Active Listening’ Seminar is one of many presentations available to student chapters and communities. Invite a CARP Staff member to visit your campus or community to facilitate an experience in Active Listening, Goal Setting, Event Planning, Vision Statements, etc. Send a message to admin@carplife.org to schedule a seminar in your area.